Use Rangda's Mask at your own peril! 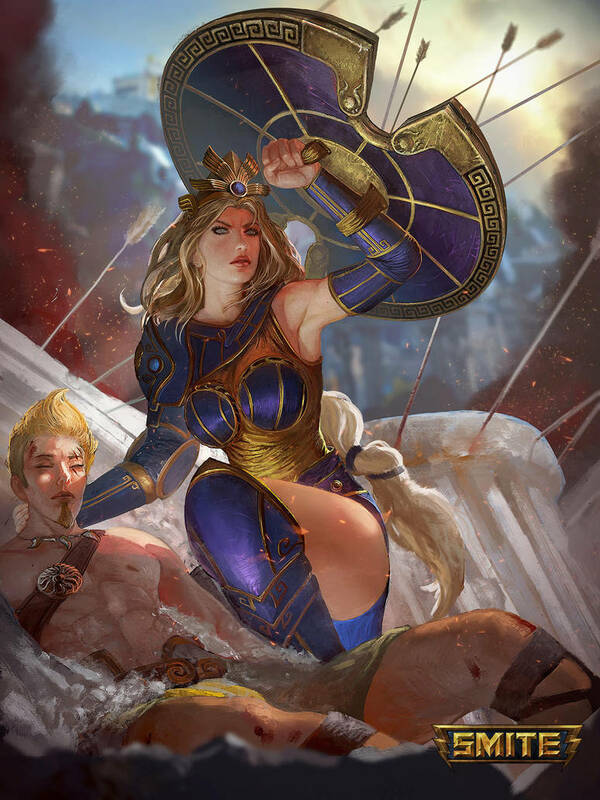 "Wisdom Shall be My Shield"
When playing damage, Athena's passive Reach is one of the integral pieces to her kit. It allows you to throw down a ranged basic attack after each use of your abilities. It will deal an extra 15% of your magical power in addition to being a ranged basic that can pierce through enemies. When combo-ed with items such as Polynomicon the basic attacks from Reach will be a force to be reckoned with! Your 1st ability is a dash that deals damage and slows the 1st enemy god hit in your path. Keep in mind that when you hit an enemy god with your dash it will stop. Also remember that this dash will be your only form of mobility outside of your ultimate ability ( Defender of Olympus), so use it with caution! Your Ultimate ability allows you to teleport to a teammate after charging up for 3.6 seconds. This give you insane mobility and allows you to teleport from 1 side of the map to the other. You should always make sure the 2nd burst of your shield wall hits! Also try to hit as many of your Reach basics as you can in between! Keep in mind that this is not the way Athena was designed to be played! If you want a normal/conventional way to play her i would recommend you play her in the support role! Playing gods well in roles they shouldn't be played in require quite a lot of experience!